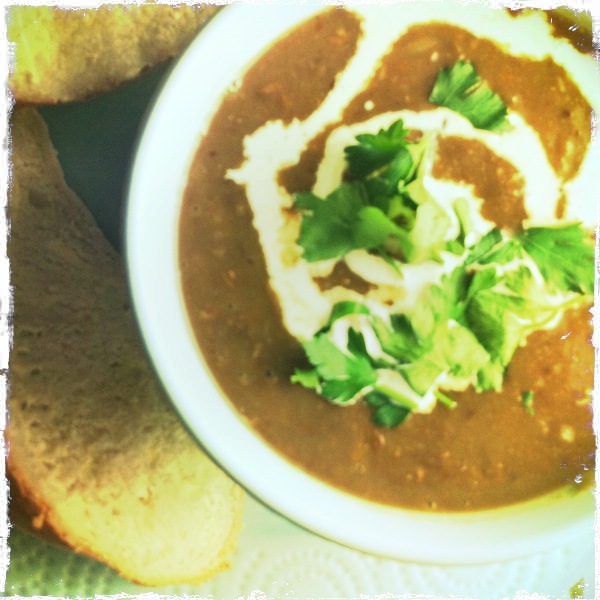 This lentil and chestnut soup is one of my “frugalised” Nigella recipes – and as well as being tasty, it’s a great recipe for using up some of the leftover odds and sods in your kitchen. Firstly, it is relatively quick to make, as opposed to those soups that sound great when you are starving… until you look up the recipe and discover that the cooking time runs into hours. 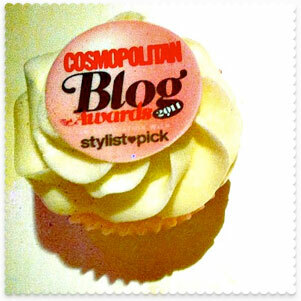 Secondly, it’s a one-pot dish that produces minimal washing-up. I make it in a saucepan, but you could also make it in a slow cooker, chucking all the ingredients in (bar the parsley and cream) and leaving it to cook on low for a few hours. This soup is featured in a couple of Nigella tomes (How To Cook and Nigella Bites – which I think is a bit of a cheat!) The original recipe calls for a teeny tin of Clement Faugier peeled chestnuts (“Their slightly candied taste adds a honeyed oomph to the soup”). Actually, if you want to remain faithful to the origial Nigella recipe, I’ve just spotted that at the time of writing, Sainsburys is doing two tins of Clement Faugier chestnuts for a fiver. However for this frugal version, I use a tin of bog standard pureed chestnuts (around £1.30, from the specialist food section of any supermarket). 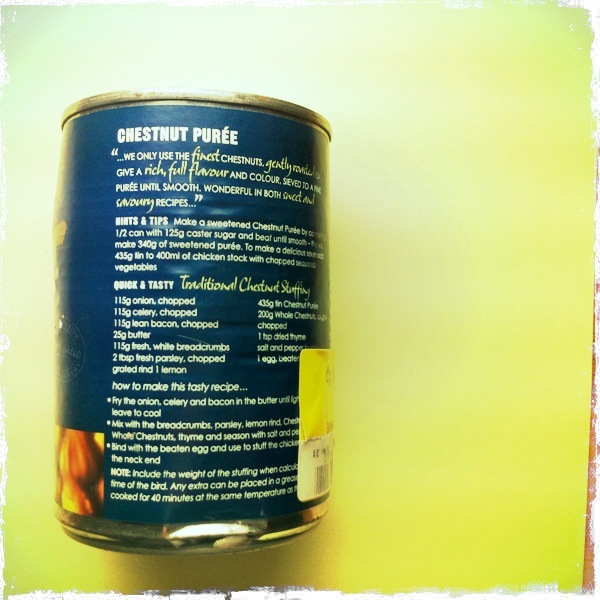 I must admit, I don’t regard pureed chestnuts as a storecupboard staple. I made this recipe after twigging that the dented tin I’d found on the supermarket discount shelf for 90p had been sitting around gathering dust for quite long enough thank you. And I’ve discovered that if you want to make lentil and chestnut soup, there is a good chance that the tin of chestnuts is all you will need to buy. You’ll probably have the rest of the ingredients already. 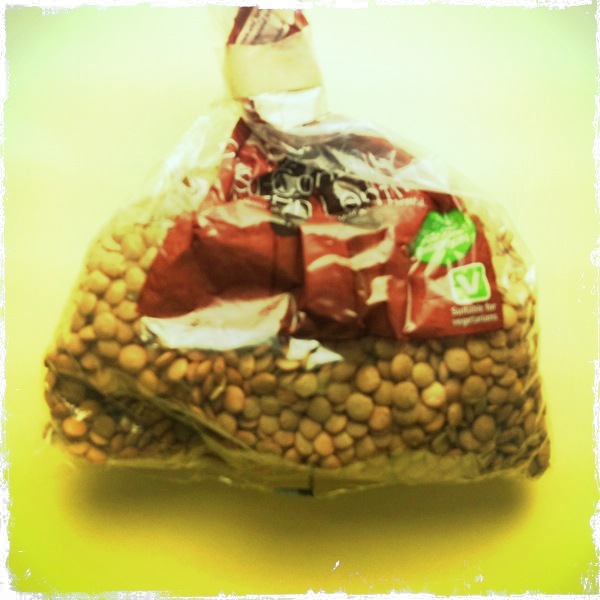 Let’s face it, everyone has one of these stashed at the back of a kitchen cupboard: an unloved, half-used bag of lentils. The original recipe calls for 225g of red lentils. Other types of lentils – the ones here are brown – are absolutely fine. The soup won’t look as pretty, of course, but it will still taste good. Plenty of salt and pepper, for seasoning. 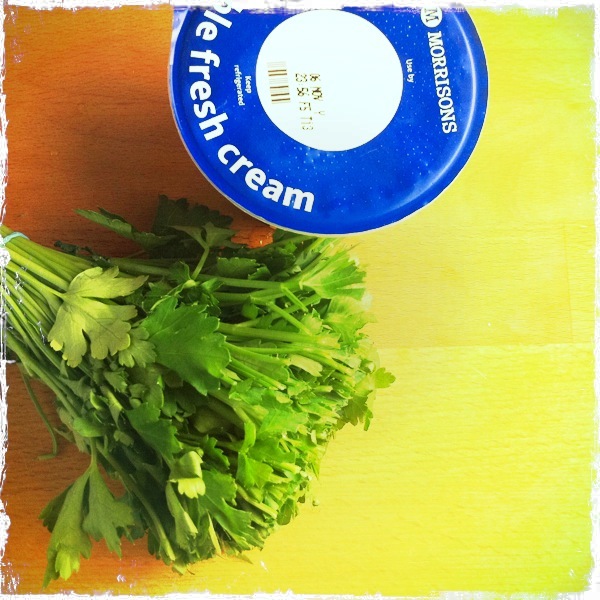 Parsley and a little cream, to serve. If you have chopped a bunch of parsley for a previous meal (as here), you can always add a parcel of the stalks to the vegetable stock and pull off sufficient leaves to garnish. 1. 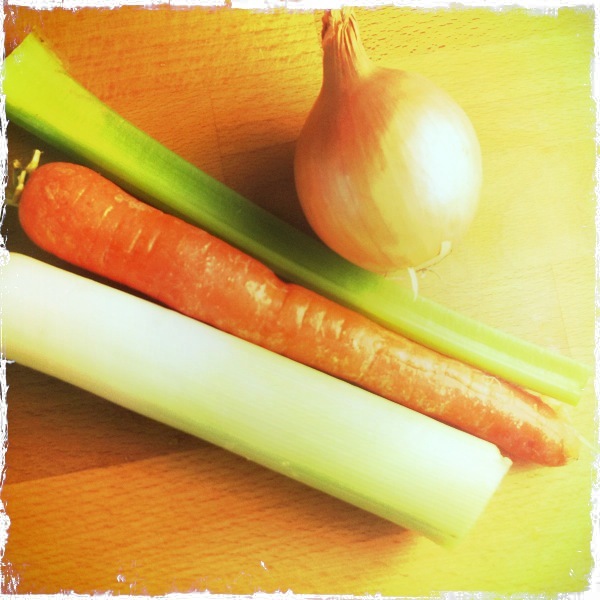 Chop the onion, leek, carrot and celery. Sweat and soften in a large, thick-bottomed saucepan. 2. Add the lentils and stock. Bring to the boil and simmer for 40 minutes until the lentils are very soft. 3. Add the tin of chestnuts and simmer for a further 20 minutes. 4. Liquidise until smooth, adding water as necessary. Taste and season well. 5. Reheat when you want to serve it. Drizzle with cream and sprinkle parsley on top. I love lentils, but they seem to have a bit of a bad reputation in the UK- glad to see a recipe using them!! 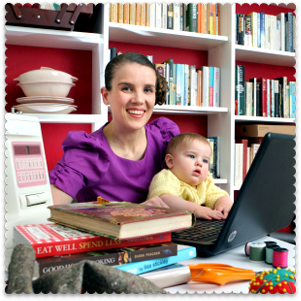 This looks really good – I am always on the look out for frugal, tasty recipes. I will try this if I can get hold of a can of chestnut puree at the local supermarket. I do cook with lentils quite a lot as they are so low cost and adaptable.